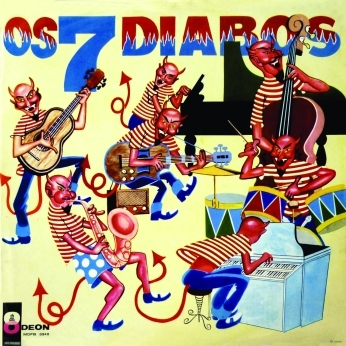 A clear case of anonymous, probably renowned musicians recording together as the fictional 7 Diabos for Odeon their only (?) recording under that name. The writer of the linear notes, signed as IRV. so that his clergyman can not identify him, does not tell us anything about their identities, but, as usual in such cases, describes the music track by track. The instruments are identified as: Órgão, bateria, contrabaixo, guitarra, violão, sax e piano + vocal.